The Beauty of Life: The Beauty of Life Featured in On Makeup Magazine! The Beauty of Life Featured in On Makeup Magazine! Exciting news, fellow beauty chicks. 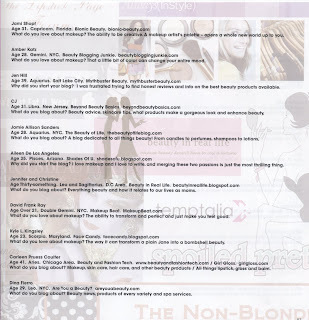 On Makeup Magazine recently did a story on the 52 best beauty bloggers, and The Beauty of Life was among them! I was so excited to be reading along and all of a sudden stop at my blog. (See below for proof!) It wouldn't be possible without all of you -- thanks for being such wonderful readers! Congrats! That's awesome! Have fun at your friend's wedding this weekend!